Leaves falling. Even though I class autumn starting as soon as September does, autumn doesn’t officially start for me until there are leaves on the ground! This one is kind of tricky. I would say pumpkin, but pumpkin doesn’t really have a smell. The only scent I can really think of is a sort of apple/cinnamon smell. There are a lot of candles with this sort of scent around this time of year. Red is my favorite color all year round, so I’m gonna choose orange for autumn. It reminds me of Halloween, pumpkins, and the prettiest leaves that fall tend to be orange. 4. What is your favorite Fall drink? Pumpkin. Spiced. Lattes. I know it’s the most basic and stereotypical white girl drink, but it tastes good. Sorry I’m not sorry. The Walking Dead I’m both dreading and looking forward to. If you’ve caught up with season six then you’ll know why. I was looking forward to Luke Cage, but I’ve already binged watched that, so I’m not sure it counts. 6. What is your favorite Fall fashion trend? At first I thought that velvet clothes were really gross, mainly because I just don’t like the feeling of materials like velvet and suede. The feeling of them under my nails makes my skin crawl. But I saw this beautiful velvet wrap dress on New Look. I loved the cut and the color, but if I brought it I have no idea where I would be able to wear it. But it’s so pretty! Also because Halloween is coming up I love Halloween themed clothes. This year I’ve seen so many Halloween jumpers, dresses, pajamas, all sorts. If I could I would just buy everything. I would post some pictures of the stuff I saw on ASOS and Boohoo but I would be here all day. 7. 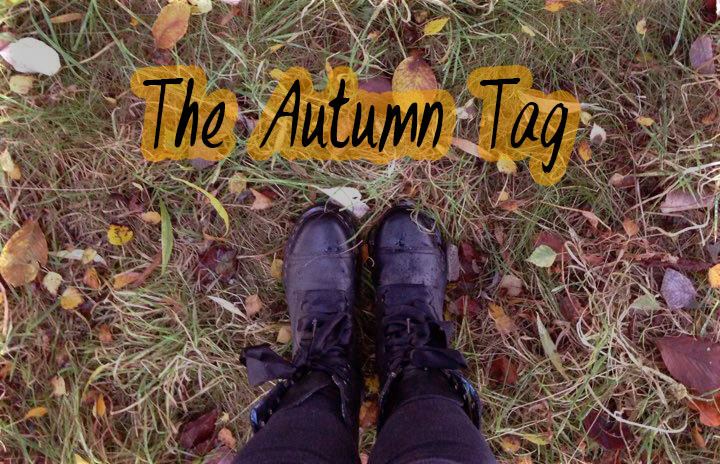 What is your favorite frugal Autumn activity? I love going for walks in autumn, and when I was little I used to go hunting for conkers. I used to take home huge bagfuls. I went looking for conkers again this year for the first time in forever, but only because I read somewhere that spiders don’t like the smell of conkers, so I collected loads to put around the house because for some reason spiders seem to love squatting in my house. 8. What is your favorite makeup look come autumnal weather? I really love that dark red/purple vampy sort of lipstick. I brought my own for the first time to experiment with. Had an episode with it earlier though, when it went everywhere and refused to come off… Other than that I just stick with what I wear all year round. There’s Halloween costume makeup, but that doesn’t really count, does it?I’m not gonna tag anyone, whoever wants to do it – here are the questions if you want to copy and paste them:1. What signifies the start of Autumn for you? 2. What is your favorite Fall scent? If you decide to do it, let me know so I can read it!